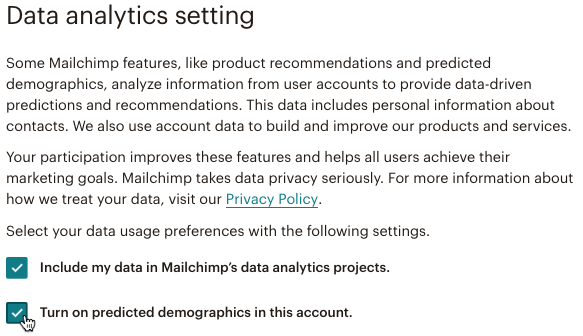 If you use Mailchimp Pro, or you’re a paid user with a connected online store, Mailchimp uses data science to predict the gender and age of your contacts with Predicted Demographics. You can improve your ROI when you identify key audiences and target them with personalized content. Use our pre-built demographics segments, or create advanced segments with demographic data to refine your marketing strategy and increase engagement. Predicted Demographics is based on shared Mailchimp account information from around the world, and uses the same gender and age range categories as Google Ads. This way you can easily apply Mailchimp demographic insights to your other marketing platforms. We provide available gender and age information for contacts in your list, regardless of whether they've engaged with your campaign content in the past. To increase the accuracy of demographic data, activate your list publicity settings. Demographic data is tied to your list. If you delete a list, gender and age range data will be removed as well. Predicted Demographics data appears in contact profiles, your list overview page, and campaign reports. Each area provides slightly different information. A contact's gender and age range. Combine this data with other tools like our VIP feature to learn who your contacts are and how they interact with your content. Gender and age ranges for your entire list. We'll display an overall percentage of contacts that match different gender and age categories. Gender and age range for the list or segment your campaign was sent to, and percentage of recipients in each demographic category. Filter demographics by total recipients, opens, and clicks, or, if you've enabled our e-commerce link tracking in your campaign, view demographics based on available purchase data. Demographic data can help you develop focused advertising that appeals to your core subscribers or broaden your marketing strategy to reach new audiences. 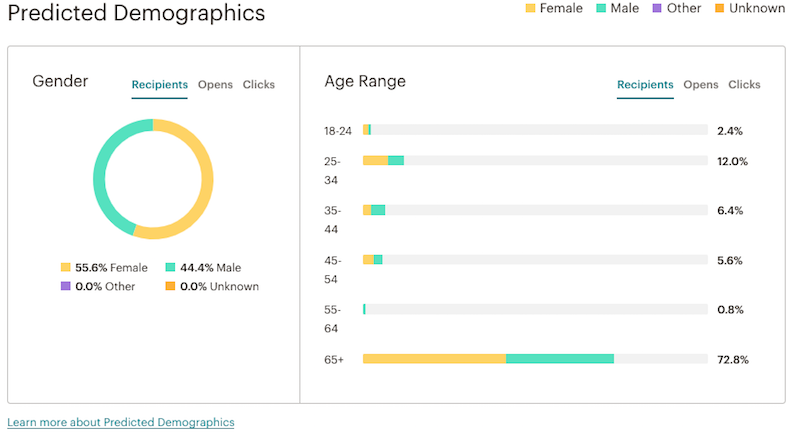 After you analyze this new data, use our pre-built demographics segments to automatically target subscribers based on age and gender. Or, combine demographics with segmentation options like campaign activity and e-commerce activity to create custom multi-part segments. Mailchimp Pro users have access to our Advanced Segmentation tool, which allows you to create complex, nested segments that include demographic data. The options that appear in your account may vary based on the data available in the list you're working with. If you notice your campaigns perform well with women 30-50 years of age, target women who are over 50 and haven't made a purchase or women under 30 who haven't made a purchase with a special offer. Segment by location, gender, and age to get a better idea of where key subscribers live, and send specialized campaigns that offer products or services that appeal to audiences in a particular region, urban center, or rural area. Create an advanced segment that uses campaign activity, gender, and age data to identify the demographics of your least engaged subscribers. Combine this information with other data you might have about your subscribers, like occupation, income level, or education level, and send specialized content to create more effective re-engagement campaigns. The predicted demographics feature is automatically enabled for Pro users and paid users with a connected online store. If you don’t want to access this data in your account, turn off predicted demographics in your data settings. To turn predicted demographics on or off, follow these steps. 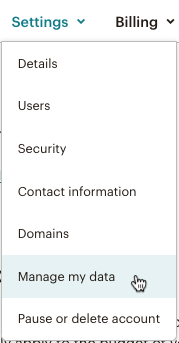 Scroll to the Data analytics settings section of the page. Uncheck the box next to Turn on predicted demographics in this account to turn predicted demographics off. Check the box to turn predicted demographics on. You're all set. A success message will confirm that your settings have been updated. Mailchimp collects data to help better understand lists, campaigns, and analyze trends. Learn more about publicity settings and how to turn them off or on. 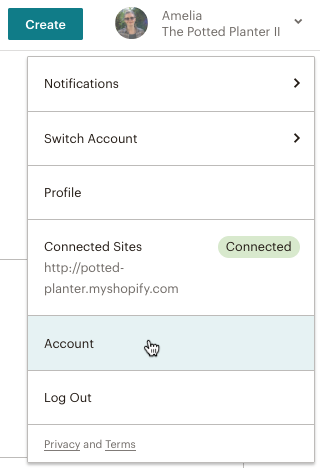 Use Mailchimp Pro's advanced segments to organize your list based on complex, nested conditions. Learn how advanced segments work and how you can use them.